– 4 digits backlit LCD with maximum 1,000 counts. 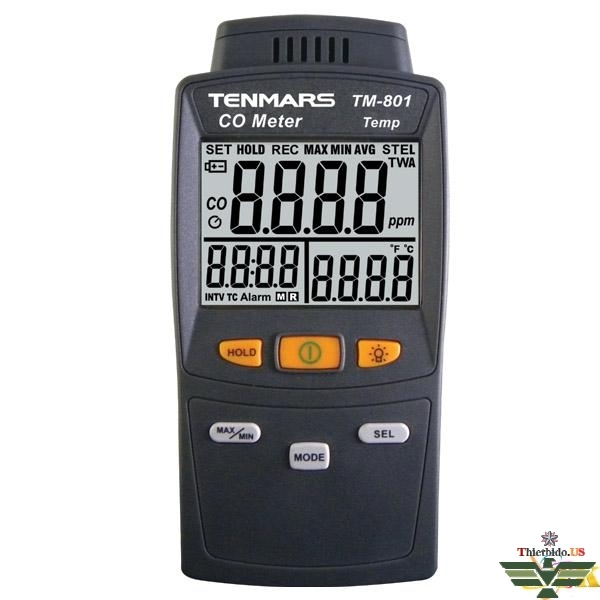 – Dual display of the readings for CO and Temperature. – CO range: 0 ~ 1,000ppm. – Temperature range: -20~50 ºC (-4~122 ºF). 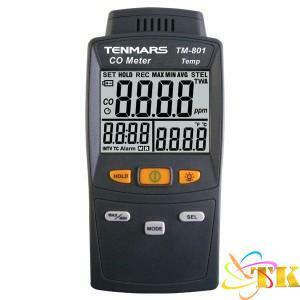 – Easy to calibrate at 100ppm or 500ppm. – USB datalogger with 8,000 records (TM-802). – Sample rate: 1 time/second. 0-1 ppm Normal background levels. 9 ppm Maximum indoor air quality level. 35 ppm 8 hours The average exposure level per U.S. OSHA workplace standards. 50 ppm 8 hours The maximum average exposure of the U.S. OSHA workplace standards. 0.01%(100 ppm) 2~3 hours evacuate people from enclosed space if the CO concentration exceeds 100 ppm per OSHA exposure limit. 0.04%(400 ppm) 1~2 hours Headache occur in 2.5 hours to 3.5 hours. 0.08%(800 ppm) 45-min Dizziness, nausea, cramps(convulsions). 0.16%(1600 ppm) 20-min Headache, dizziness and will be dead within 2 hours. 0.32%(3200 ppm) 5~10 min Headache, dizziness, vomiting and will be dead in 30 minutes. 0.64%(6400 ppm) 1~2 min Headache, dizziness and will be dead within10 to 15 minutes. 1.28%(12800 ppm) 1~3 min Cause death.